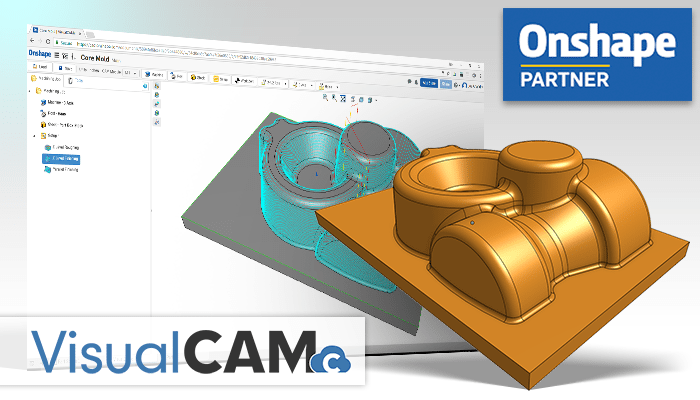 VisualCAMc for Onshape is CAM software application on the cloud that allows you to create 2 ½ Axis, 3 Axis and 3+2 milling cutter paths for Onshape design files. This product leverages the legendary manufacturing capabilities of our Windows desktop CAM software VisualCAM running on the cloud. A brand new browser based user interface allows this product to be used from any computer, any time and from anywhere in the world. We are offering an attractive introductory price for this product. Click on the button above to go to the Onshape App store and subscribe to VisualCAMc. VisualCAMc is the first full-cloud production CAM solution for Onshape and is now available in the Onshape App Store. The ability to perform CAM/CNC programming from anywhere and on any computer is a reality now with VisualCAMc. This application builds upon years of product innovation development of MecSoft’s flagship desktop product. Machinists, manufacturers, furniture designers, prototyping, makers and CNC enthusiasts all say they use MecSoft’s CAM products for one very simple reason – they are fast and easy to use. VisualCAMc provides a complete set of 2½ milling strategies including Facing, Pocketing, Profiling, Engraving, V-Carving, V-Carve Roughing, High Speed Pocketing, Chamfering, Hole Profiling, Hole Pocketing, T-Slot and Thread Milling. For CNC milling in 3 Axis, VisualCAMc provides Horizontal Roughing (also called Z-Level Roughing) and four finishing strategies including Parallel Finishing, Horizontal Finishing, as well as Radial and Spiral finishing. VisualCAMc supports indexed machining with the use of multiple Setups. Often referred to a 3+2 Machining, this allows you to perform Indexed 4 Axis and Indexed 5 Axis machining. The Machine Definition in VisualCAMc allows you to select between 3, 4 and 5 Axis. Selecting 4 or 5 Axis allows you to then specify the 4th Primary and 5th Secondary axes definitions. When you post-process, the angle motions required to move from one setup to the next are posted to the g-code file. VisualCAMc also provides a complete set of hole-making strategies including Drilling (standard, deep, counter-sink and break-chip drilling), Tapping, Peck Tapping, Boring and Reverse Boring. VisualCAMc includes a high-resolution cut material simulation engine coupled with a new Simulation Toolbar. You can play, pause, and step through your toolpath simulations, control the simulation speed and see in-process cut material /stock from one toolpath to the next. The VisualCAMc user interface provides easy access to all of the tool sets needed to quickly and efficiently setup and program toolpaths for your Onshape part designs. The VisualCAMc toolbar provides a straight-forward progression of the machining process. Working from left to right, the buttons, menus and icons allow you to define your Machine Tool, Post-Processor, Stock, Setup, Work Zero and an extended assortment of 2-1/2 Axis, 3 Axis and Hole machining strategies. Once your toolpaths are generated, you can verify them by performing a cut material simulation. VisualCAMc includes a complete simulation module and toolbar. It allows you to Play, Stop, Pause and simulate To End. You can also adjust the simulation speed. Every cutting tool motion is simulated and the in-process stock remaining is displayed from one toolpath to the next. You can select from over 300 pre-configured post processors supporting all of the popular CNC machine controllers on the market today. You can post one or more toolpath operations, a setup or the entire machining job. The posted g-code file is downloaded directly to your local hard drive and displayed in your default text editor where you can edit it further and run the program on your CNC machine. The posted g-code file contains all of the standard ISO codes specific to your controller. The table below summarizes the current features of VisualCAMc. Additional features are being added and the product will be periodically updated as new features become available..